MPAA rating: R for some strong violence and pervasive language. Perfect in the sense that all the characters blended, the pace and direction, mood and even the tiny part players made a perfect soup. Michael R Roskam’s “The Drop” falls into that file. Roskam’s Brooklyn neighborhood bears no resemblance to Woody Allen’s candy colored Brooklyn streets, or Spike Lee’s hair-on-fire social sidewalks. Roskam drops us down in the kind of forgotten neighborhood that despite all the rapid social changes of the city, stays the same, like a pothole that no one has the interest or money to fix. Here, young working class descendants of immigrants live in the neat flower boxed row houses their parents and grandparents built. It is a cityscape of forgotten dreams, and streets where dreams die. On one of the streets here, a bar called Cousin Marv’s fills the needs of the working class, and those of the black-suited local gangsters, now Chechens who have replaced the Irish and Italians who once fattened up on the illicit appetites of the dwellers, booze and gambling replaced by heroin. Marv’s bar is one of the mob’s “drop bars,” with hidden slots in the bar and safes where, once a week, especially on big game nights, mobsters from all over the city stash their non taxable earnings. On one of these occasions, as on Super Bowl night, over a million dollars is stashed in Cousin Marv’s, giving us a shocking finale that reveals long hidden secrets of all the players. Cousin Marv (our last view of the great James Gandolfini) lost his bar in a bad deal with bad guys. Now it’s owned by Chovka, the Chechen gang boss, a suave, almost sophisticated killer, leaving Marv a fat, cynical and embittered loser who lives with his sister. And then there is Bob, Marv’s cousin, (Tom Hardy, this decade’s heir to Brando, but an amazing talent quite his own) handy man, bartender and ultimately something much more. Bob pours whiskey, pops beer and early each morning, attends mass at St. Doms, the local parish, but as a local Catholic detective notices, he never takes communion. One cold, dark night we will find out why. Deeds, Nadia, Bob and the puppy, whom Bob names Rocco after a saint’s name he spots on a church statue, form the core of the story, with Gandolfini’s cousin Marv looming over them like a malevolent puppeteer waiting to pull all the strings down. Much of director Roskam’s success here, I suspect, is due to a magical coalition with some amazing talent: the story comes from Dennis Lehane’s short story “Animal Rescue.” Lehane, a successful Boston scribe ” Mystic River,” “Gone Baby Gone,” also wrote the tightly woven script. And it didn’t hurt to have brought Gandolphini and the haunting Noomi Rapace, and John Ortiz,who plays the relentless homicide cop, into the mix. With Nicholas Karakatsanis’s camera following them through the wintery streets, and designer Therese DePrez’s smoky neon-blessed bar scenes to film in, Roskam sets himself up for an Oscar nod. James Gandolfini has left us, but he will forever be a movie icon. Noomi Rapace, the tattooed survivor of the “Dragon Tattoo” trilogy, is gifted and here to stay. 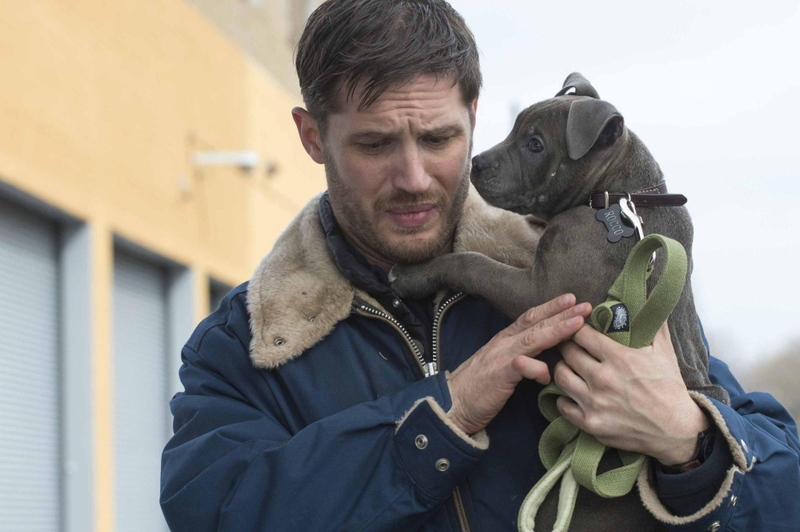 But the story and the film, in fact each scene, hang on the power of Tom Hardy’s “Bob.” Hardy, who is best known for playing the villain Bane in “Dark Knight Rises” and his powerful tour de force work in the British film “Locke,” has cut a frame for himself in American films. Here, his character will be compared with Brando’s Terry Maloy in Elia Kazan’s “On The Waterfront.” But Maloy was a punchy ex-boxer. Bob, at first, appears to be the “special” cousin shuffling through life, but as we discover in the final scenes, he is so much more. Hardy, even with four great performances under his belt, may well turn out to be the British version of Meryl Streep, promising a long career of one stunning performance after another, as he has here in Roskam’s perfect noire thriller.